Alex Clarke at Denison Superyachts Division tells me that the Mondo Marine yard has found a buyer for his central listing for sale, the 41m superyacht Alexander Two. Alexander Two was built by Italian yard Mondo Marine in aluminium to a design by Cor D Rover with interiors by Luca Dini and was launched in 2009. MCA compliant and built to ABS class, she accommodates 10 guests in five staterooms, including a master suite on the main deck plus four staterooms below and all have en suite bathrooms. She recently had a two month refit to refresh her interior décor. The refit consisted of new soft goods, window & wall treatments, linens, carpeting, and upgrading of the wood finishing throughout. The end result is a yacht in as-new condition with under 400 original hours on the engines. 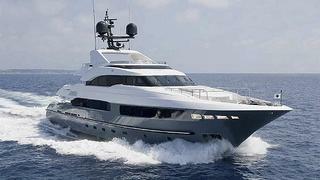 Twin 2,251hp MTU engines give her a cruising speed of 17 knots and she has a range of 3,200 nautical miles at 12 knots. Alexander Two will be renamed Legenda and was asking €8.8 million.